You’ve probably heard of the recently released film, “God’s Not Dead.” It’s been getting a lot of attention and while I haven’t seen it, I understand it is based on a college student defending his Christian faith in a somewhat hostile classroom environment. His defense of God’s existence is based on several “proofs” for God that some believers have applauded as being very convincing, while skeptics have poked holes in. I don’t know if anyone has come to faith as a result of this film. I do know that faith in Christ is a gift. Hymnwriter Carl Schalk wrote that it burns it’s way into our hearts, unasked, unforced unearned. The various accounts of the Easter story in the Gospels have many similarities but also some differences. Matthew, Mark and Luke describe several women coming to the tomb early on the first day of the week to do the Jewish burial rituals that the previous Sabbath rules had prevented them from completing. But this morning we heard the Easter account from the Gospel of John. And John has a unique approach in telling the story of Jesus. John is not only reporting carefully researched facts, but recording events from Jesus’ life so that we might believe and have life. John’s Gospel is full of those who encountered Jesus personally and believed in him and received the gift of life. And in John’s telling of the Easter story, only one person – one woman arrived at the tomb. According to John, she came alone. And had a personal encounter with something and someone she was not exactly looking for. The story of Jesus’ suffering and death is painful to hear. It may even bring tears to our eyes. There are no light-hearted moments; little reason to smile. It’s hard to imagine anyone making a joke about it or having fun at Jesus’ expense. Mississippi Coroner Dexter Howard is used to dealing with death . . . he works with dead bodies death every day. But he was not prepared for what happened to him on February 27. He received a call that 87 year old Walter Williams had passed away. 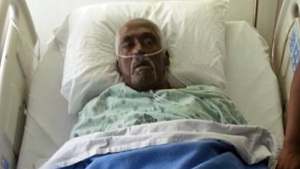 It was no surprise to his family; he had been on hospice care for some weeks. Dexter went to the home to collect the body. He checked Walter’s pulse from his lifeless body and when he found none, he was declared dead. He placed Walter in a body bag, zipped it up and took it to the funeral home where he laid it on the embalming table while he completed some paper work. And then he noticed something . . . the bag was moving . . . the man’s legs were kicking . . .he unzipped the bag and Walter’s eyes were opened and he was breathing!! He was alive! Apparently, Walter had a defibrillator in his chest that jumpstarted him back to life! The family called it a miracle.